Christmas preparations in the White House are in full swing. This year, the 46-year-old first lady, Melania Trump, is in charge of the festive activities, and she takes her job very seriously. The process started with the most important symbol of the holiday, the Christmas tree, arriving on November 20th, which was received by the FLOTUS herself and her 11-year-old son Barron. The huge tree, which measures 19,5 feet in length, was delivered by horse-drawn carriage. It is a Balsam fir that comes from Wisconsin and was provided by the Chapman family of Silent Night Evergreens, which won the contest this year. On Twitter, Melania shared a few pictures of herself hanging toys on the tree, putting final touches on the decorations, and checking out the traditional gingerbread in a shape of the White House. It is remarkable that she chose two wintery outfits for the photo-shoot, both times opting to wear coats even though she was inside of the house. Preparations are underway to celebrate holidays at the @WhiteHouse. 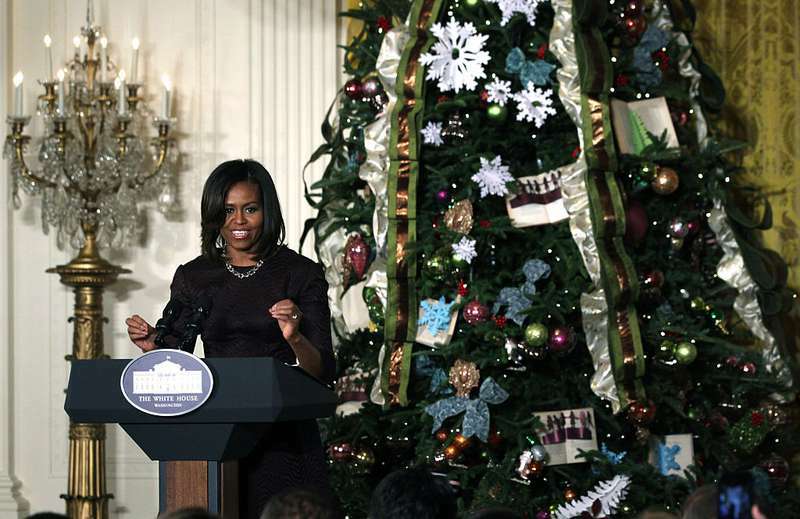 The First Lady is traditionally responsible for choosing the theme for the festivities and decorating the Christmas tree. For example, Hillary Clinton chose to demonstrate the America’s talents, while Laura Bush highlighted her love to animals, choosing the theme “All Creatures Grand and Small” in 2002. Another successful holiday theme was introduced by her in 2008 under the name "A Red, White and Blue Christmas". It was inspired by the Americans who started writing letters to the White House after September 11th, suggesting this idea. The greatest blessings of all are the ones that don't cost a thing: the time that we spend with our loved ones, the freedoms we enjoy as Americans and the joy we feel from reaching out to those in need. For President Trump, last week was indeed full of festive events, with the famous Turkey Pardoning ceremony held on November 21st. Now the family is getting ready for their first White House Christmas, and we are sure that this one is going to be unforgettable.